Georgia Power recently released its timetable and other key update points for their wind turbine project on the Skidaway campus. The wind turbines will be installed in the large field along McWhorter Drive. 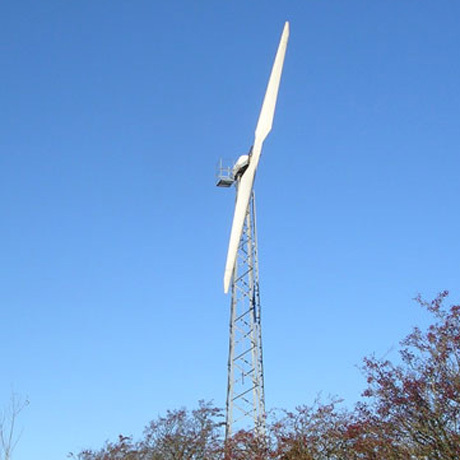 While the exact model of the wind turbines has not yet been determined, this is an example of the type under consideration. – The University System Board of Regents has signed a lease agreement with Georgia Power for this project at the large field on SKIO’s campus as we described previously. – The term is for 2 years with an option for 1 additional year if needed to complete the research. – Georgia Power plans to install the meteorological tower later this summer. – Plan is to install the 4 turbines in 2016. – To get good data covering all seasons of a year will likely require more than 12 calendar months after the turbines have been installed. – Georgia Power contracted with Georgia Southern University whose professors have already started gathering data for the research project into avian and noise effects of the small wind generation technology. – At the conclusion of the research project and before the lease expires, the small wind turbines will be removed. – Skidaway Institute will decide whether to keep the meteorological tower for their use or not. The Skidaway Institute campus will soon be the site of a “small-wind” demonstration project to study the feasibility of generating wind power in Georgia using small scale wind turbines. The Georgia Power-sponsored project will feature four small scale turbines, up to 10 kW each, or the size that an individual/customer might install on their own property, plus a meteorological tower. The turbines will be located in the large field adjacent to McWhorter Road on the main section of the campus. While the equipment selection has not been finalized, the turbine height could range between 90-140 feet, or about one-third to one-half the height of large-scale wind turbines. The Board of Regents approved placing the site on the Skidaway campus at its April board meeting. Georgia Power will lease the property for two years with an option for an additional six months. When the research project is complete, the agreement calls for the test turbines to be dismantled and removed. Georgia Southern University is also partnering in the research on this project. GSU’s primary focus is to study the environmental aspects of small wind turbines including the impact on noise and avian life.